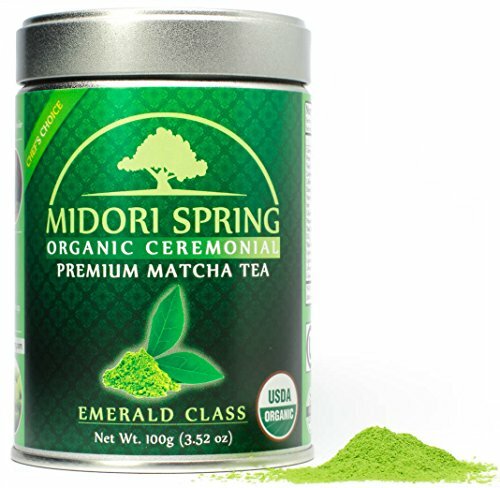 Midori Spring's Ceremonial Emerald Class Matcha is 2nd in our line of premium ceremonial Matchas. It is rich, smooth and creamy with a hint of sweetness when brewed traditionally. This premium product is Ceremonial Grade and is Organic (USDA, JAS) and Kosher (OU) Certified. We carefully select the raw material from our tea gardens mostly from Aichi and Kagoshima in Japan and maintain the highest standards in production. Our Matcha has a fresh, sweet, green-vegetable-like aroma. The colour is a vibrant green. Only Ceremonial Grade Matcha encompass these features. You can enjoy Midori Spring's Ceremonial Emerald Matcha as a tea brew or use it in - baked goods, raw treats, smoothies, yogurt, ice cream, or create your own Matcha inspired recipe. Whichever style you choose to have your Matcha, you can experience the many health benefits it has to offer since Matcha is a Superfood. There are many immediate and long term health benefits when consuming Matcha, which include: increase in energy without the jitters, reduce stress and improve mental alertness, improve metabolism and help with weight loss, boost immune system and reduce inflammation and help the body cleanse of harmful elements. Give back to your health and embrace the power of Matcha. BODILY BENEFITS ✪ Our Emerald Class Organic Matcha is rich in antioxidants, with greater than 137x the EGCG levels that of regular steeped tea. Organic Matcha has been shown to help (1) Increase energy levels (2) Help reduce stress and improve mental alertness (3) Support metabolism (4) Support immune system (5) Help the body cleanse of harmful elements. TRUSTED CERTIFICATIONS ✪ Certified USDA Organic via the U.S. and Japan's transparency agreement, JAS Organic certified by OCIA Japan, OU Kosher Certified, VEGAN.ORG Certified. In addition, All Midori Spring Ceremonial Grade Organic Matcha is also GLUTEN FREE, GMO FREE, and contains no pesticides, soy, wheat of any kind. 100% QUALITY SATISFACTION GUARANTEE ✪ We at Midori Spring believe in our products 100%. However, our customers are just important to us. If you are not 100% satisfied with our product FOR ANY REASON, please contact us immediately. We offer 30 DAY no questions asked MONEY BACK POLICY for unopened or damaged items. We are here for any questions or concerns you may have. If you have any questions about this product by Midori Spring, contact us by completing and submitting the form below. If you are looking for a specif part number, please include it with your message.